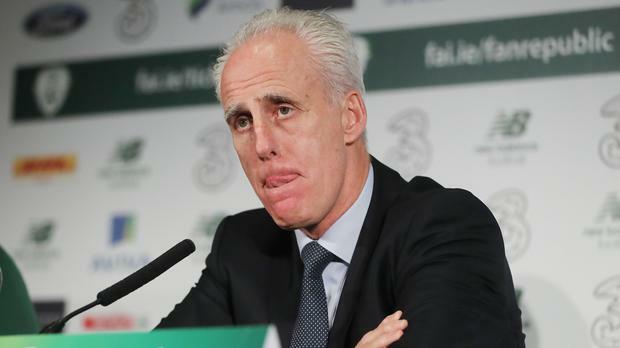 Mick McCarthy's first stint as Ireland manager ended after the turbulence of a stormy year. And it's the elements that might well pose the biggest threat to a winning return as the rocky road towards Euro 2020 kicks off in the picturesque surroundings of Victoria Stadium. With the Rock of Gibraltar behind one goal and the airport visible at the other, it's a dream venue for photographers. But a local weather warning related to high winds and the impact that might have on the exposed artificial pitch that needed to pass inspections earlier this week adds a wild-card element to proceedings. McCarthy was in good spirits yesterday, joking about the climate of Barnsley, Glasgow and Sunderland when pressed on the conditions. He said that a few of the players felt a bit nervous before their plane hit the runway, whereas he found it all fairly smooth. The hope is that this showdown with the world's 194th-ranked team will be an equally serene experience for the 60-year-old. It was put to him that an opening double-header with the minnows and a home clash with Georgia was a favourable start when it comes to generating momentum. "We haven't got any points yet," was his cautionary warning. That said, he didn't deny the premise. With the qualifying group being played out inside the calendar year, Ireland have to hit form quickly. For all that the players want to move on from past year, with captain Seamus Coleman referencing the importance of not saddling new faces with any of the "baggage", the visitors still need to address the problems that dogged them. Ireland failed to score in the months of October and November and McCarthy admitted that he was none too impressed with what he was seeing in the first training session of the week when it came to the area of attacking play. Problem "I wasn't happy with the amount of chances that we were creating, or players getting into the box," explained McCarthy, who turned to his assistant Terry Connor with a view to sorting the problem out. "TC put a great session on exactly for that - on the third day - and we gave them the feedback on the night, and just showed the difference between how you can do it. "We have worked on it and that's pretty much all you can do, give players information in terms of wanting people to get in there and just cry and create more chances and have bodies in there on the move. Hopefully, we can do it." The choice of personnel will give the clearest yet into the manager's way of thinking. He confirmed that the players will wake up this morning having already been informed who will start - a contrast from Martin O'Neill's way of doing things. McCarthy confirmed that Coleman will start the match, winning his 50th cap in the process, but was a bit more guarded when it came to certain other positions, although he indicated that Robbie Brady could be vulnerable due to his struggles at Burnley this season. "He's fit enough to be here and contribute," said McCarthy. "But he's not been starting many games." The main decisions for management are down the spine of his side. Shane Duffy is a lock at centre-half, and he's got a choice between the experienced Richard Keogh and the in-form Sheffield United player John Egan as a partner. In midfield, Jeff Hendrick should play, while the other contenders for a central berth are Glenn Whelan, Harry Arter and Conor Hourihane. If it was a showdown with an opponent that was likely to have more of the ball, then perhaps the claims of Whelan or Arter would be stronger. In the circumstances, the goalscoring reputation of Hourihane might tip the balance his way, even if it's possible an alternative formula will be used on Tuesday. David McGoldrick is well regarded by McCarthy and this is the perfect opportunity for him to show what he can do in the creative sense. Seán Maguire is his most likely strike partner, although the manager is mindful of the Preston player's injury record. Given that the playing surface can be hard on the body, it would be a surprise if he lasted the duration and Luton's James Collins can expect to win a first cap at some stage. With Coleman at right-back, Matt Doherty is in line to feature on the right sdie of midfield, with Enda Stevens and James McClean given the opportunity to strike up another alliance on the other flank. "It is a fresh slate for everyone," said Stevens, who insisted he was not taking his position for granted even though he's the only left-sided defender in the squad. Before flying to Gibraltar, the squad got to say goodbye to Jon Walters, an inspirational figure en route to the last Euros in France. "He nearly carried us there," admitted Coleman, who paid a warm tribute. Now is the time for new heroes to emerge. John Fallon and Daniel McDonnell John Delaney has been told by the FAI to stop using his phone and credit card after he stepped aside from the association.